Human Rights Defenders in West Papua accuse the Australian Government and an Australian-owned mining company, Paniai Gold, of being involved in ongoing military operations in Paniai, West Papua. Mr Ferry Marisan alleges that the Australian-trained Indonesian counter-terrorism unit Detachment 88 (also known as Densus 88 or D88), is involved in ongoing military operations in Paniai. According to Marisan, the Director of Elsham Papua, the Institute for the Study and Advocacy of Human Rights in West Papua, the joint police and military D88 have been embedded in the Second “Coconut” (Kelapa Dua) paramilitary Police Force (Brimob) sent from West Java for military operations against suspected members of the West Papua Liberation Army (or TPN), based at Eduda, Paniai. According to Mr Yones Douw, a human rights defender based in Paniai, D88 are currently being deployed against members of the TPN in a jungle warfare operation. John Yogi – the Paniai based commander of the TPN – and his men, believed to number a few dozen, fled into the jungle following an attack on his base in Eduda by the Indonesian military and police between the 12-15 December. Marisan says that in total 30 people have died during the latest round of violence in Paniai Seventeen people were shot dead during the military operations in Eduda. Only ten of these victims were members of the TPN, according to Marisan. Between the 9th and 14th of December a further three people died, all from exposure related sickness. Amongst the dead were two children aged two and four. Prior to the military operations Brimob also shot dead eight Papuans. Yogi’s men responded by killing two Brimob soldiers, an event that triggered the recent military operations. In addition Elsham Papua reports that the following six villages were burnt to the ground: Toko, Badawo, Dogouto, Obayoweta, Dey, and Wamanik. As a result of the violence Marisan says that up to 20,000 people have fled their homes. ”They are living in government care centres, or staying with family and friends. Many have also fled to the forest” says Marisan. Irrespective of the training that both the Australian and U.S government’s say they provide to D88 , both Douw and Marisan claim that group is being used in military operations against so-called separatists. “Many of the victims in these operations” says Marisan, “are not members of the TPN, they are ordinary Papuan villagers who are supposed to be protected by the state”. D88 was also allegedly involved in the killing of six Papuans at the conclusion of the Third Papuan Congress on October 19. D88 is not the only link between Australia and the recent wave of violence. These same documents state that “security [for the DRG Project] will be provided by the local Paniai police and Brimob (Indonesian paramilitary police) under the supervision of a Company Security Officer”. 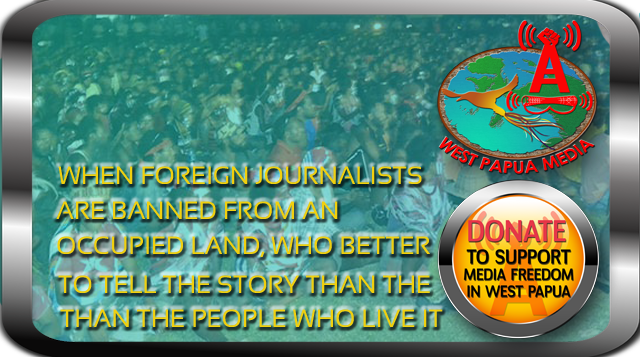 West Papua Media attempted to contact Mr Savage for comment, but he was not available. The 2011 November-December military operations are not the first military operations in the area. Paniai was the scene of widespread military operations between 1963-1969, 1977-1978, and again in 1981-1982. During this period U.S. supplied Bronco aircraft were used to bomb villages while helicopters strafed Papuans with machine gun fire. “People don’t forget these things easily” says Douw.